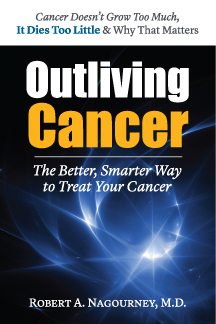 During my interview with Jeff Michaels on the March 28, 5:00 P.M. Fox News, we explored the themes of my current book, Outliving Cancer. One of the points that most interested my interviewer was the appropriate use of our laboratory platform for the selection of therapy. He asked, “Are there some patients for whom there is no cure?” I responded by explaining what it is, that our laboratory test is designed to do: “Cure the curable, treat the treatable, and avoid futile care.” Jeff Michaels stopped me and asked that I might repeat what I had just said. It seemed that my succinct description resonated. However simple this distillation of our work may seem, I realized it was actually rather profound. After all, we are confronting an escalating crisis in medicine. How do we meet the needs of a growing population of cancer patients with shrinking resources? How do we allocate treatments to those most likely to respond and finally, how do we avoid the misadventures of toxic and ineffective therapies for those destined to fail chemotherapeutic intervention? On every level, laboratory models can assist us. For those patients with early stage breast cancer, ovarian cancer, small cell lung cancer, non-Hodgkin lymphoma and many leukemias, the expectation of a cure is well within our reach. These patients must receive the very best treatments from the start. This is a particularly delicate circumstance as it forces the doctor, the patient and the family to confront the most difficult question of all, “Am I dying?” The answer is “maybe.” Without seeming flip, every patient no matter what diagnosis, has some chance of response to therapy. If we examine the performance characteristic of our laboratory analyses, they consistently double response rates. With this group however a doubling of response rate may still provide a rather low likelihood of meaningful benefit. If the laboratory finds drug resistance in this group, it is a near certainty that the patient will not respond. However distressing this data may be, it may be comforting to know that the patient has left no stone unturned. For those patients where a treatment appears active, despite their diagnosis or treatment history, then the discussion surrounding tolerance, toxicity and realistic likelihood of benefit can be undertaken intelligently. This is the embodiment of rational therapeutics. My book of the same title (Outliving Cancer, Basic Health 2013) is an exploration of cancer biology through the lens of individual patients. The conceptual framework within which my laboratory operates, reflects the basic premise that cancer doesn’t grow too much it dies too little. Thus, effective cancer therapy (regardless of contemporary wisdom) provides benefit only when the drugs induce cell death. While the forms of cell death may vary from necrotic, to apoptotic, autophagic and others, it is, in the end, the death of the cell that heralds a successful outcome. We, along with a small group of collaborators, have pioneered the concept of individualized cancer care using each patient’s tumor as the study model. Fresh biopsies exposed to chemotherapies and signal transduction inhibitors, live or die depending upon their relative sensitivity to the drugs in question. The simple elegance of our platform has provided immense insight into cancer biology, insights we describe in the book, which may ultimately lead to a greater understanding of all human diseases. Having successfully applied this approach in many diseases, we have published findings in leukemia, breast, ovarian, and most recently, in lung cancers. We are now very excited by observations in one of the most difficult cancers – pancreatic. Ongoing work in this disease will be the subject of upcoming clinical trials. One patient with pancreatic cancer comes to mind. Steve Lockwood presented to medical attention in the Spring of 2010 with weight loss, abdominal pain, and unrelenting low back pain. He was seen by a local medical oncologist after a CT scan revealed a large mass in the pancreas, extensive liver metastases and disease throughout the abdomen. He then sought the opinion of UCLA and the City of Hope. Neither institution could offer any solutions. Luckily his wife, a nurse, had heard about our work and brought him to Rational Therapeutics. His tumor markers were doubling every week. He couldn’t eat and required daily intravenous hydration, as well as high dose narcotics to get through each day. He was deteriorating so rapidly that I had concerns that he might be too ill for me to help. We decided to conduct an open liver biopsy. As his tumor markers, CA19.9, climbed into the multiple thousands, we found a three-drug combination to be the most active for his tumor. Within a week, the pain began to subside. After two weeks, it was demonstrably better. By the time we began treatment cycle two, he had begun to gain weight and came off pain medications entirely. Two cycles later, his tumor markers were normal and his PET CT remarkably improved. An additional cycle later, his PET CT was normal. While there are many difficult cancers, metastatic pancreatic cancer figures among the worst. The fact that we could find a treatment was cause for celebration. The fact that Steven now remains in remission, after three years, is nothing short of a miracle. As I have written before, there are two kinds of cancer patients: those we can treat and those we can’t. Steve Lockwood turned out to be one of those patients we could. Like Niebuhr’s Serenity prayer, oncologists need the serenity to accept the cancers they cannot treat, the courage to treat those that they can, and the wisdom to know the difference. It is our use of laboratory assays to select treatments that provides us with that particular form of wisdom. I met a charming patient in my office this week. A gentleman with advanced gastric cancer. Upon further examination of his cancer, the adenocarcinoma cells were found to be strongly positive for human epidermal growth factor receptor 2 (HER2). Many of my readers are familiar with this surface receptor, a member of the epidermal growth factor family. It’s discovery, and the subsequent development of treatments directed toward this target, are well described in the literature. While most people are familiar with this protein in breast cancer, it is only in the last several years that we have recognized the importance of HER2 expression in diseases like gastric and esophageal cancer. Discussing the implications with the patient and his sons, I realized that this attractive therapeutic target might not be available for use due to the patient’s underlying heart disease. One of the toxicities of HER2-targeted therapies is congestive heart failure. As I pondered the dilemma, I was reminded of one of my patients from 16 years earlier. At that time, a strapping 69-year-old woman arrived in my office with a large, high-grade breast cancer and 13 positive lymph nodes. She was also HER2 positive. The problem was that in 1997, the drug trastuzumab was not widely available and never (not ever), used in the adjuvant setting. With that as a backdrop, I treated the patient based on laboratory analysis using the best combinations I could identify. Now, 16 years later, still free of disease, she represents a rare success for someone afflicted with such aggressive (and yes, HER2-positive) disease. The reason this former patient came to mind was that her excellent success 16 years earlier had not required the use of HER2-directed therapy. Ingrid Ottesen had done very well using assay-directed therapy chemotherapy without the addition of trastuzumab. All we needed for Ingrid was the best use of available drugs. Despite the possible contraindication for trastuzumab in this gentleman’s case, we can still hope for a good outcome if we use the available drugs that best meet his need. After all, it worked perfectly for Ingrid. You can read about Ingrid in Chapter 14 in Outliving Cancer, to be released later this month. Like all physicians and scientists engaged in the study of cancer biology and cancer treatment, I had accepted that cancer was a disease of abnormal cell growth. I remember reading the lead article in the New England Journal of Medicine (NEJM) that described the clonogenic assay (Salmon, S. E., Hamburger, A. W., Soehnlen, B. S., et al. 1978. Quantitation of differential sensitivity of human tumor stem cells to anticancer drugs. N Engl J Med 298:1321–1327). I sat in a laboratory at Georgetown University reading about a lab test that could accurately predict the outcome of cancer patients, without first having to give patients toxic drugs. It seemed so logical, so elegant, so inherently attractive. Sitting there as a medical student, far removed from my formal cancer training, I thought to myself, this is a direction that I would like to pursue. But I was only a first year student and there were miles to go before I would treat cancer patients. Nonetheless, selecting drugs based on a laboratory assay was something I definitely wanted to do. At the time I had no idea just how difficult that could prove to be. After medical school I found myself in California. There I met an investigator from the National Cancer Institute who had recently joined the faculty at the University of California, Irvine. He too had read the NEJM paper. Being several years ahead of me in training he had applied the clonogenic technique at his laboratory at the National Cancer Institute. Upon his arrival in California, he had continued his work with the clonogenic assay. Despite the enthusiastic reception that the assay had previously enjoyed, the hundreds of investigators around the world who had adopted it and the indefatigable defense of its merits by leading scientists, it seemed that something was very wrong with the clonogenic assay and I desperately needed to know what that was. Despite the clonogenic assay’s supporters, it turned out that killing cancer cells outright in the test tube was a much, much better way to predict patient’s outcomes. It would be years before I understood the depth of this seemingly simple observation and the historical implications it would have for cancer therapy. In Chapter 7 of my soon-to-be-released book, Outliving Cancer I examine the impact of programmed cell death on human biology. This is a question that has vexed scientific investigators for centuries, and for the last century, our belief was predicated upon physical observation that cancer reflected altered cell growth. After all, to the untrained eye, or even to the rather sophisticated eye, the mass in the pelvis or the lymph node under the arm, or the abnormality on a chest x-ray, continued to expand upon serial observation. This was “growth” (at least since the time of Rudolph Virchow); and growth it was reasoned represented cell division. As in many scientific disciplines, nothing spoils a lovely theory more than a little fact. And, the fact turned out to be that cancer does not grow too much, it dies too little. Cancer doesn’t “grow” its way into becoming a measurable tumor, it “accumulates” its way to that end. In 1972, we realized that the most basic understanding of cancer biology up to that point was absolutely, positively wrong. Working in a laboratory during my fellowships, I began to realize that something was wrong with the principles that guided cancer therapeutics. My first inkling came from the rather poor outcomes that many of my patients experienced despite high-dose, aggressive drug combinations. Then, it was the failure of the clonogenic assay to predict clinical outcomes that further raised my suspicions. I began to ponder cell growth – cell death, cell growth – cell death. With each passing day the laboratory analysis that I conducted identified active treatments that worked. Using short-term measures of cell death (not cell growth),. I could predict which of my patients would get better. All of the complicated and inefficient clonogenic assay investigations could not. Cell growth – cell death – what was I missing? It would be years before I would attend a special symposium on the topic of cell death that it all became abundantly clear. My “eureka” moment is captured in Chapter 6 of my soon-to-be-released book, Outliving Cancer.